New Delhi, April 20: Shab-e-Barat, the holy night of fortune and forgiveness, will be observed by Muslims in India tonight. Shab-e-Barat, also known as Laylat-ul-Baraa or mid-Shabaan, assumes significance for Sunni Muslims adhering to the Barelvi and the Deobandi school of thoughts. Shab is an Urdu word which means night, while Barat is an Arabic noun which is roughly translated to English as either innocence or salvation. It is believed that on this night, which comes 15 days before the holy month of Ramadan or Ramzan, God decides the fortunes of men and women for the coming year and showers his forgiveness. Shab-e-Barat Mubarak 2019 Messages: WhatsApp Stickers, GIF Image Greetings, SMS & Wishes to Send Ahead of Ramadan. Muslims believe Shab-e-Barat marks the night when God seals people's fate in terms of life and death until the next year. According to a Hadith in Baihaqi, Prophet Mohammed told his wife Hazrat Aisha: "...record is made of every human being who will be born, and of every human being who will pass away this year. In it their deeds are taken up to heaven and in it their provisions are sent down." The festival is also known as the night of forgiveness. It is reported from Hazrat Ali that Prophet Mohammed said: "When the middle night of Shaban arrives, spend it in worship and fast during the day. On this night, at sunset, Allah descends to the nearest heaven and announces: ‘Is there no one asking forgiveness that I may forgive him? Is there no one asking provision that I may grant him provision? Is there no one afflicted that I may relieve them? Is there not such and such?’ (He keeps announcing) till the dawn comes." On Shab-e-Barat, Muslims observe special prayers and worship the entire night to seek forgiveness for their sins. 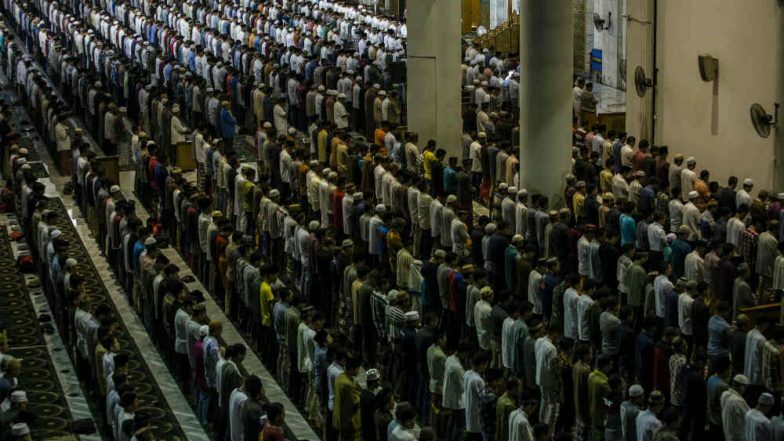 Since the festival is considered to be the 'Eid of those who have died', several Muslims visit their nearest graveyards to seek forgiveness for their deceased relatives. Many also observed a fast the following day.